This afternoon a bunch of electric cars and motorcycles, plus assorted Segways, bikes and the odd skateboard, could be found speeding silently down The Mall in London, a stone’s throw from Buckingham Palace. There were plenty of impressive machines to peer at, plus the odd celeb to spot. Here’s a small selection of my snaps from the Start Eco Car Spectacular. There were several Tesla roadsters rocketing down The Mall, testing my ability to get a sharp shot of a fast-moving car. They really are quick off the mark and ghostly quiet. Click the image for a bigger pic. I have no idea what this tiny blue electric thing is, but I’d like to have a go in it. Not every electric vehicle was as speedy as a Tesla. 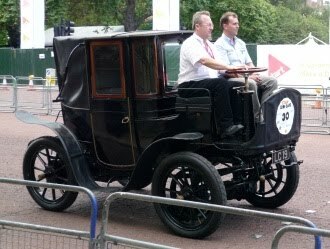 This veteran car was a reminder that battery power was in vogue in the 1890s. No doubt the Jeremiah Clarksons of the day complained that it couldn't remember its way home if you fell asleep at the reigns, and stubbornly refused to refill itself when left to its own devices in a grassy paddock. This pair of G-Wiz made up for their lack of pace by weaving impressively from side to side – without falling over. 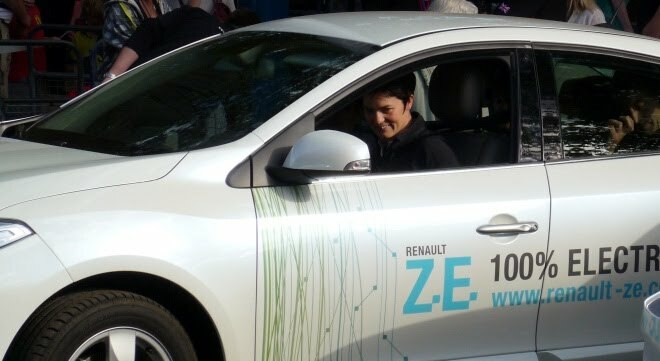 Yachtswoman Ellen MacArthur clearly enjoyed her spin in a Renault Fluence ZE electric saloon. Veteran racing driver Stirling Moss looked somewhat less entranced by his trip up and down The Mall in a two-seat Smart Electric Drive. But then pretty much every journey must seem tame after you’ve driven the Mille Miglia at an average of 103mph – with drum brakes.